The external media. What are they saying about MLP? Is it good? Bad? Do they get the details right? Do they judge? I wanted to talk about this Shortpacked strip for a while. Is this happening in the pony community? That no one cares about rooted hair? Rooted hair is the nylon brushable hair that a lot of MLP toys use. One of the big debates among toy collectors apparently is whether it's better to do that or use solid plastic hair sculpts. Wow, a SP MLP strip that doesn't involve Sodomuffin. Penny Arcade had a cameo from Ditzy Doo a few days ago. Skin Horse has had ponies on a few occasions. 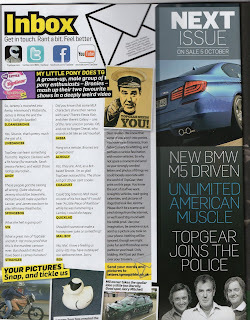 You damned Bronies got your Ponies in my Top Gear. MLTG is two great tastes that taste great together. The video was mentioned both on theTransmission blog and in Top Gear Magazine. Sweet! We've finally got Doug Walker, the man himself! This got posted on EQD. For the most part, this was a very positive article. Edited by Guardian Prime, 17 September 2011 - 08:51 PM. Most excellent. The Pony influence has officially spread into IRL mainstream media. In our home state, no less! Makes sense that it would pop up here first--Portland is generally pretty weird-friendly. Still wish someone like Entertainment Weekly or TV Guide or someone would do a piece about the actual show. Positive press or not, I'm bothered that such an excellent show is being overshadowed by its own fans. Mad just referenced MLP during their Cowboys & Aliens parody. Applejack appears even though her hat was wrong & had Rarity's cutie mark. Still, pretty funny! EDIT- Now another reference, during a parody of the new Thundercats pilot, a Rainbow Dash stand-in can be seen invading Thundera as part of an army of internet memes. Edited by Don_East, 26 September 2011 - 07:53 PM. Thanks for the heads up, Don_East. I'm a few timezones behind you for Cartoon Network, so I had time to catch this and upload it to my newest YouTube channel. Here's the MLP/Cowboys & Aliens parody on MAD. There are a lot of MLP references in this one. Other than the name "Applejack," there are no canon characters in specific (copyright reasons, I'm sure) but a few might resemble somepony we know. Edited by Guardian Prime, 27 September 2011 - 03:02 AM. Wow...that Thundercats one was amazing! It's the first Mad toon that was somewhere in the area of being amusing.